There’s something wrong with the 10×10 canopy you have set up in your backyard. Sure it’s awesome and all at keeping out the sun and you always got some cozy shade when you need it. But once that sun sets its close to useless! And chances are, you’re like me and you’re not gonna put it away at night and you’re gonna leave that sucker set up so you won’t have to do it all over again tomorrow. Well, thanks to Coleman, you can now have a 10×10 canopy that will finally get some evening usage, and it may very well be your next favorite place to have dinner or even entertain guests after dusk. You gotta love innovation. A 10×10 canopy with an LED lighting system is the perfect solution for all the common problems with enjoying the outdoors at night. This baby sets up in around 3-5 minutes so you’ll be ready to go quick and easy. After it’s up, you can enjoy the use of the four built-in ultra-bright LED fixtures with four regular size D batteries. Another cool feature is that you won’t ever worry about having to set the mood as this 10×10 canopy also comes with it’s very own dimmer to control the LED lights! So whether you’re in need of a brightly-lit work station out in the wilderness or you’re celebrating your anniversary with a home-cooked meal with the wifey, this Coleman LED-powered canopy may be just the thing. 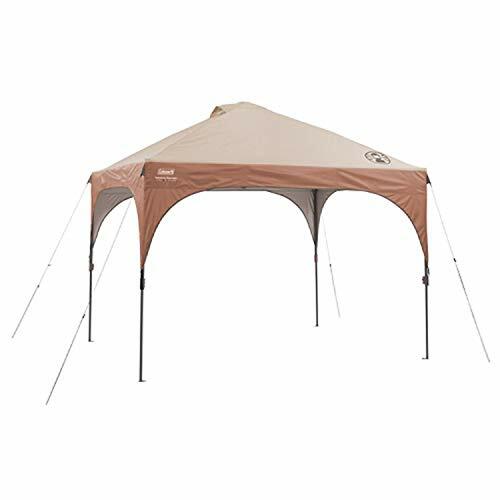 One thing to note: though this 10×10 canopy is perfect for lighting up your evening, it is NOT waterproof. The design is not meant to keep water or rain out so don’t take any chances out in a storm. So click on the button below and take some LED technology with you on your next adventure. Light up the night with a brand new Coleman 10×10 canopy!